Euclid’s Elements has been the introductory text to geometry since it was compiled by the Greek mathematician around 300 BCE. Thanks to its use of simple axioms to derive complex geometric and mathematical problems (including the Pythagorean theorem and early systems of algebra and number theory), The Elements is one of the most published books ever. It is only since its assimilation into broader mathematics textbooks in the twentieth century that it has ceased to be required educational reading. With innumerable editions, it takes something unusual to stand out from the crowd, and Oliver Byrne’s 1847 version is unusual in the extreme. Byrne (‘surveyor of Her Majesty’s settlements in the Falkland Islands and author of numerous mathematical books’) used coloured lines and shapes to define points, angles and planes – rather than the usual letter-labelling – in an attempt to make the propositions and problems easier for students to understand. Byrne’s system explodes from the page in a barrage of reds, yellows and blues. Such visual extravagance is indicative of the confidence he had in his system – colour printing was expensive in the nineteenth century – and it was rumoured at the time that his book bankrupted the printer. Despite its sensational appearance, however, Byrne’s Elements did not prove popular, being too far removed from prior mathematical texts for most readers. His book was generally dismissed as a curiosity and his system was derided as too confusing, a solution to a non-existent problem. If Byrne’s grand experiment was never widely adopted, his geometric simplicity and his arresting combinations of simple colours prefigured Mondrian and the experimental graphics of De Stijl and the Bauhaus. His edition of The Elements of Euclid remains remarkable not just for its stunningly modern visuals but as an attempt to re-imagine graphical information against a 2000-year status quo. 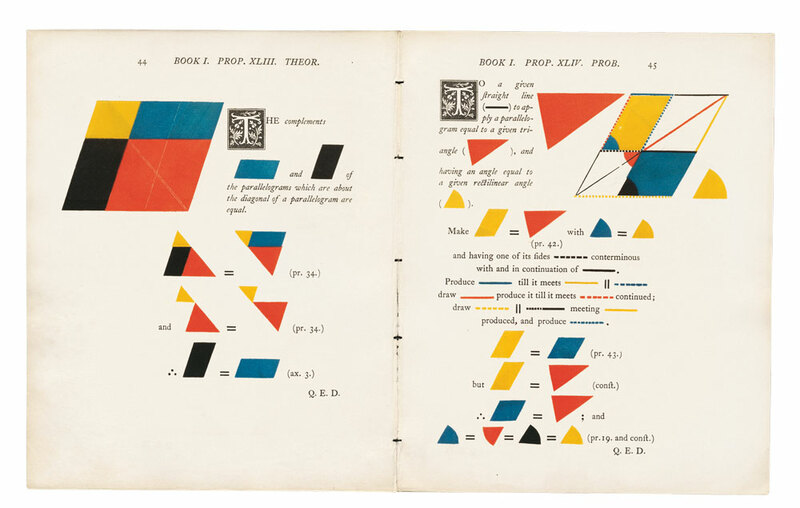 Top: a theorem (verso) and problem (recto) concerning angles within parallelograms in Oliver Byrne’s The Elements of Euclid (published by William Pickering, 1847). Image courtesy of digital publishing service 42-line. 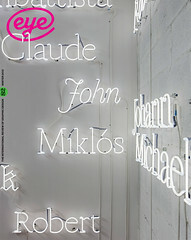 A facsimile of this edition was published by Taschen in 2010.